HealthOffice® Anywhere has the features you need to ensure that your tracking and reporting not only meets your needs, but also is a secure and user friendly program. Integrated Software Suite - One database to make record keeping and tracking efficient and effective. Secure - Authorized users are able to access only the information relevant to their position, and all changes are logged to prevent confusion and mistakes. Web-Based - No installing, upgrading, or IT department needed, everything is accessed securely online. Integrated Solution - Everything you need all in one program, from scheduling to compliance. Health Portal - Securely provide parents with direct access to data. 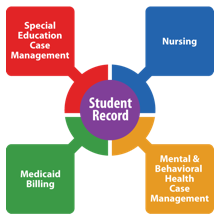 Our software has the features needed to seamlessly and accurately integrate your district's medical and Medicaid records. Contact us today to learn more about our software's features and how they can benefit you.